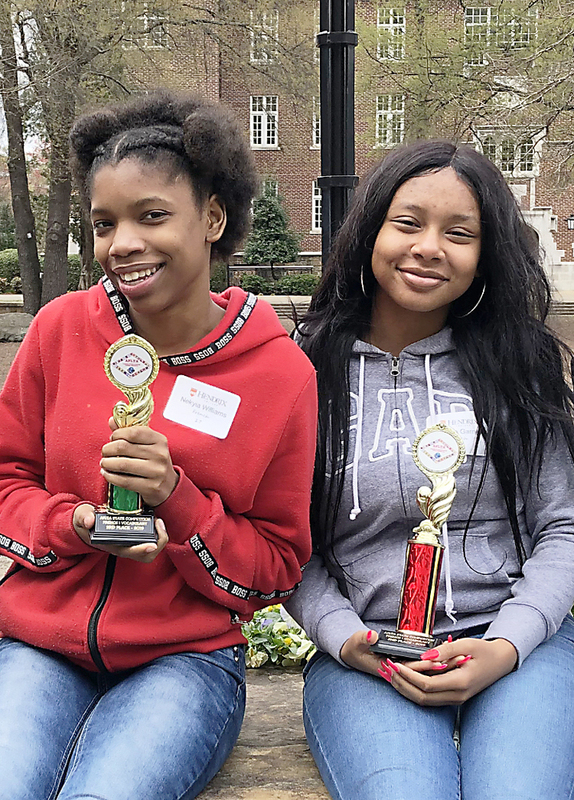 Camille Garner (right) earned second place and a trophy at the Level 1 French Vocabulary Bee during the March 30 AFLTA World Language Competition, and Nekyia Williams finished third with a trophy at the Level 2 French Vocabulary Bee. Eleven BHS students were part of the 847 persons who participated in the competition. Lisa White wasn’t exactly sure how the Arkansas Foreign Language Teachers Association World Language Competition would ultimately turn out, but she was always confident in her students and knew they would give it their best efforts. And at day’s end White, French teacher Candie Groves and their students were already discussing next year’s event. Eleven students from Blytheville High School on March 30 competed at the AFLTA World Language Competition at Hendrix College in Conway. The competition challenged students from language programs all over Arkansas in Spanish, French, Latin, German and Chinese to a variety of categories including speaking, reading, culture, art and performance. The students who were selected to compete not only worked in class daily preparing flash cards, asking questions and taking practice tests online, they also put in a significant amount of time studying outside class. A total of 847 students participated in the competition. Camille Garner earned second place and a trophy at the Level 1 French Vocabulary Bee, and Nekyia Williams accounted for third place and a trophy at the Level 2 French Vocabulary Bee. White, BHS’ Spanish teacher, added “This was the first time for my students to compete in a world language competition; although they didn’t know what to expect, they performed very well. I am excited that they are already talking about competing in next year’s competition. We cannot be more proud of how our students represented BHS today at their very first foreign language state competition,” she added. • Kyriana Slater, Kaylie Aldridge and Chante Primas each earned earned Honorable Mention at the Level 2 Spanish Vocabulary Bee.